Social media network GetGlue has released a new app that brings its service, dedicated to the world of entertainment, to the iPad. GetGlue is a social network that allows users to “check in” as they watch a specific movie or TV show, read a book or attend an event and receive personalized recommendations based on their preferences, in addition to earning special rewards from several entertainment brands. Think of it as Foursquare for movie and TV buffs. Although GetGlue has been available in the form of a free iPhone app for some time, the company has now released an app for the iPad that takes full advantage of Apple's tablet device to provide users with access to the social network. Alex Iskold, GetGlue’s founder and CEO says the free iPad app incorporates overlays and pull-down menus for improved interaction with other GetGlue users. As with the iPhone app, GetGlue for iPad users can check in to their favorite events and share their check-ins with friends through Twitter and Facebook. In addition, the app makes it possible to rate shows and events, and to track and earn rewards. 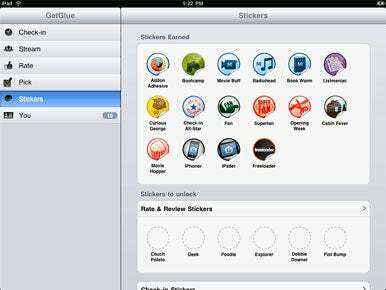 GetGlue offers digital and physical stickers to frequent users of its entertainment-based social network. Besides unveiling its iPad app Thursday, GetGlue also announced more partnerships with a number of entertainment companies. Two noteworthy partners, in light of the upcoming fall TV season, are Fox and PBS. In conjunction with Fox, GetGlue will offer rewards for fans of Glee and Bones, in addition to a pair of other shows debuting this fall on the TV network (Raising Hope and Lone Star). As for PBS, GetGlue is broadening its relationship with the public broadcasting network to offer rewards for watching upcoming miniseries, including The Tenth Inning, God in America, Circus, and Michael Feinstein American Song Book. Other GetGlue media partners include HBO, Showtime, and Universal Pictures. GetGlue rewards include digital and physical stickers representing assorted achievements by users of the GetGlue service. Iskold says the stickers appeal to users by putting a new twist on the idea of rewards. “Even bigger, is the fact that these rewards are for people's favorites shows, movies, music, and books,” he told Macworld. Updated at 1:40 p.m. PT to include more information throughout the story.